SwipeSimple’s additional features allow for constant improvement and acceleration of transactions! Save Customers’ Information and Card on File. Store customers’ information including address, purchase history, and cards on file to better serve your customers, efficiently process repeat orders, and more. Subscriptions, Installments, and Scheduled Payments. Charge customers at any time using their stored cards, schedule payments for a future date, split payments into installments, or start a recurring payment for repeat customers and services. Use data to improve your business with reports on scheduled payments and information on your top customers, in addition to all your other SwipeSimple reports. Take keyed card payments on mobile or web securely and conveniently. Bluetooth low energy to eliminate audio jack connectivity issues. EMV Quick Chip to optimize and speed up the checkout process. Accept all digital wallets including NFC Contactless, Apple Pay, Andriod Pay and Samsung Pay. You have the option to input additional details in reports for each keyed transaction including cardholder name, reference number and more! 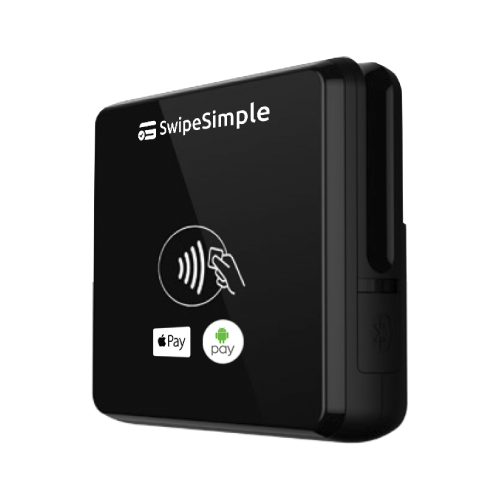 Merchants can accept card payments using any device, and track their keyed transactions in real-time, alongside all other transactions in their SwipeSimple reports. AVS details can be sent to supported processors, allowing you to lower your transaction fees and reduce fraud.